Last week I shared a trash to treasure project using a stool I found curb side. With an Anthropologie Luxe Fur stool as my inspiration, I ordered a yard of fabric from Amazon and a glamorous stool was born! 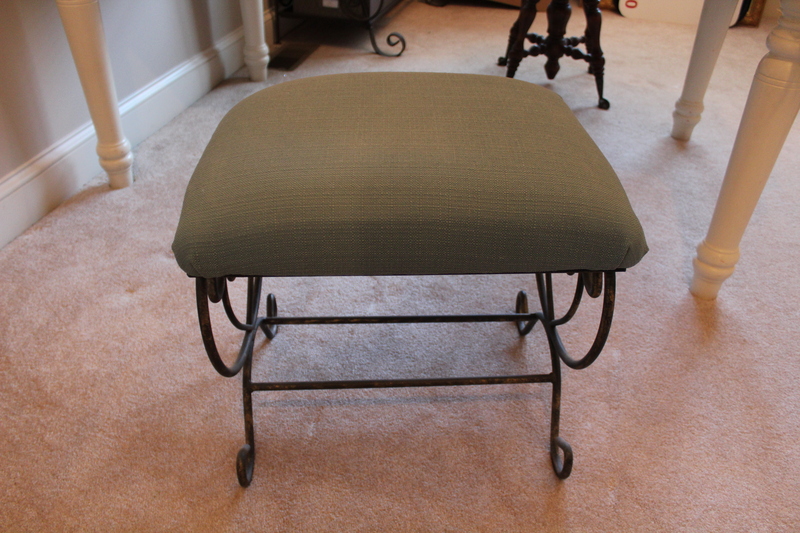 Well, I had some faux fur left over…..
My Anthropologie knock off stool turned out so adorable! I love the transformation! See the before and afters below. I had about a half a yard of the Faux Fake Fur Monkey White fabric left over. The original plan was to make a pillow but I remembered a stool I bought a while back from Homegoods on clearance for $35. The fabric was a teal/blue color with a bronze metal base. The stool was perfectly fine in its found condition, but since it is going in our newly renovated master bathroom, I thought it could use a little make over as well! The process was super simple and took 20 minutes start to finish and that included vacuuming up the mess. I flipped over the stool and removed the 6 screws using a drill with a screwdriver bit. (Aren’t those the best?) Once the cushion was removed from the base, I cut the fabric to size and stapled it to the bottom of the cushion. I trimmed off the excess fabric and screwed the base back onto the newly covered cushion. So quick and easy! I love how this stool turned out! I’ve named her Donald.